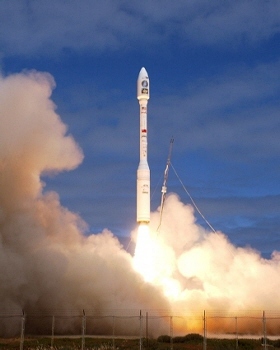 A Taurus rocket carrying Taiwan's ROCSAT-2 satellite lifts-off from Space Launch Complex 576E at Vandenberg AFB. To access launch photos, videos, and audio reports, visit the Vandenberg Rocket and Missile Launch Multimedia library. Image courtesy U.S. Air Force. This schedule lists rocket and missile launches from Vandenberg AFB for the next several months. It is a composite of unclassified information approved for public release from government, industry, and other sources. This schedule is essentially accurate at the time of publication, but may disagree with other sources. Details on military launches are withheld until they are approved for public release. For detailed information about this schedule, refer to the Notes section below. To receive this launch schedule and launch updates by e-mail, click here. All launch dates and times are subject to change and are listed in 24-hour format. The dates and times in this schedule may not agree with those on other online launch schedules, including the official Vandenberg AFB schedule because different sources were used, the information was interpreted differently, and the schedules were updated at different times. The webmaster does not post the dates, launch windows, and times for military launches until they have been officially released by the Defense Department. All launch dates and times are given in Pacific Time using a 24-hour format similar to military time (midnight = 00:00, 1:00 p.m. = 13:00, 11:00 p.m. = 23:00, etc.). The above schedule makes no distinction between Pacific Standard Time (PST) and Pacific Daylight Saving Time (PDT). PST is in effect from the first Sunday in November to the second Sunday in March. PDT is in effect from the second Sunday in March to the first Sunday in November. Launch dates are fluid and tend to change over time. Launches for all vehicles except the Pegasus XL are scheduled for the start of the launch window. Pegasus XL launch times are scheduled for the middle of the launch window. Prior to the launch of a classified payload, the exact launch time is kept secret until about T-18 to T-4 hours. The launch window is also secret and not made public. Instead of providing the launch window, the Air Force announces a launch period - a large block of time within which the launch window falls. For additional information on Vandenberg AFB launches, refer to Viewing Vandenberg AFB Launches. Copyright © 2001-2019, Brian Webb. All rights reserved.